We are finally back from an exhausting but ever lasting racing adventure In Utah. 5000 miles plus, 3 days there, 3 days back. What a great track! AHRMA was extremely nice to us, letting us share a garage with Mary and John Schultz on one side and Murray Haynes on the other. Both keep a parenting eye on us and it made us really feel at home. The Nortons were surrounded by the military H.D. tank shifter and a Buell and Brammo. Pretty eclectic garage….. Tons of Honda Cb160’s, and a huge gathering of sidecars, made spectating a real pleasure. The mountains’ surroundings could also get you into out of your racing concentration as you sucked on the thin air and felt like you needed a Coke or some aspirin…..
Friday we had a good practice, gearing seemed a bit long on all bikes, but we were just not up to speed. 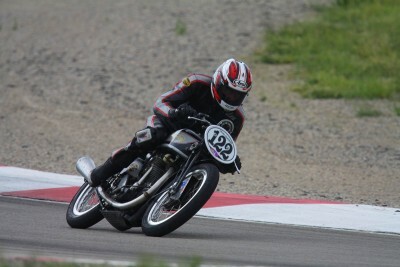 Memory of the track came galumphing back, and Cindy and I were knocking 4 seconds off on each new practice session. Jetted down the Oldboy (1937 Norton), at low revs the there was a big hole in the carburation, running rich low down, accentuated by the altitude. Saturday I felt weird, nervous, apprehensive, slow. Some of the competitors I didn’t know, and Dave Roper had been hired to ride a really nice Velocette, and he seemed to be just flowing around the track nicely…..
Pre 40 race was a good warm up race and I picked up a good rhythm, not hanging around with Art Farley, as I wanted to but changed my plans. The Replica 1962 Manx was running really well thanks to the VP gas we brought, and we easily won those races too, Classic 60’s and 500GP. As for Class C Foot it was I thought, going to be a hard one. Dave got a good start and I just eased myself behind him in turn one. Then I see him banging his bike against a novice rider as he tried to go around the outside, and both ran wide off the track. It was time to take advantage of this mayhem and I got out of there, hoping not to be caught. Won the race with a big advantage so we had the perfect day, 4 out of 4. Feels good. Cindy Hill our mascot, went out there and finished 2nd in her first race at Miller on the stock Honda Cb400 F. Again 4 more seconds off her lap times!!! We haven’t even pulled the spark plugs out of this bike. No jets, no gearing, just some good Avon race tires and that is all (and apparently some great riding by Cindy). Sunday we all felt better. I was pretty relaxed knowing how well we did the day before. Great race with Art Farley, winning by 13/1000 of a second in Pre 40; then in 500GP the engine makes a nasty noise on the first laps and I pull off immediately (top end timing went south, but after inspection it is not as bad as I thought and will be ready for Barber). Class C Foot race, Roper is lined up and gets around turn won in front, but I get a better drive and I never see him again. I find out later that he threw it away in the the Attitude Corners after “comfortably settling into 2nd place”. 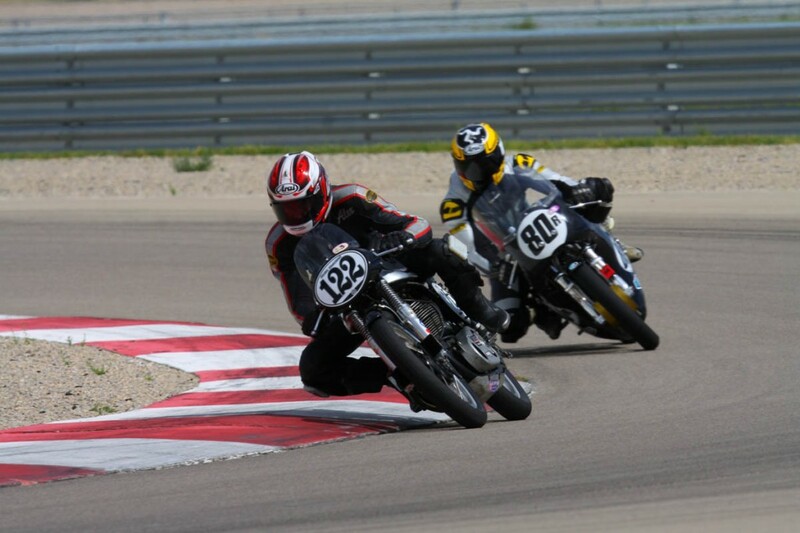 Cindy hill knocks off another 4 seconds off her lap times, and wins her race, after John Miller had a timing chain problem on his Honda 350 twin….. A win is a win, right? I have ordered her a bigger helmet size……..
To finish this report I would like to help you understand how we do all this. The only way is to mention all the people and sponsors involved. Everyone is Key to our racing. A big big thanks to all.